Lets be honest; I don’t need too many reasons to sit on my couch on a Saturday and drink whiskey. Likewise, I don’t usually have blog-worthy experiences… but here we go. Let me start by saying, my Big Green Egg is old. Old enough that I don’t know exactly how old it is. Old enough that it predates me, by at least 10-15 years. 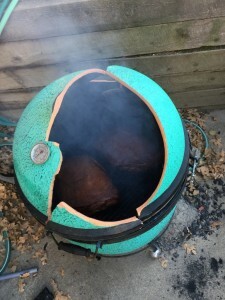 When I was first bitten by the smoking bug, I was poor – poor enough that a $1200 new Big Green Egg was laughable. I can’t have a grill that’s worth more than my car. So you can imagine my joy when I found this Egg on Craigslist for a couple hundred bones. 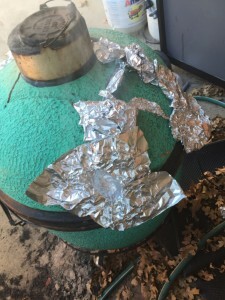 The guy I was buying it from, Jim, had owned it for a couple decades and had finally upgraded to one of the new BGEs… it was sitting there on his back patio, shining in the sun like an emerald jewel capable of grilling, cooking, baking, smoking, well… anything. Sitting next to it like the old family dog on its last legs was my bride-to-be. Squat, ugly and clearly a predecessor from a bygone era, it held an eclectic hipster beauty all its own – it was *vintage*. Jim spoke of it like it was an old friend. “We’re only upgrading because we can’t fit enough burgers on it at once… it’s really treated me well.” The wistful notes in his voice only stoked my own excitement – this battle-proven beast was soon to be all mine. “Be careful though,” Jim told me. This Egg far predated the modern era of Space Shuttle Ceramics, and was made of lowly ceramics. It wasn’t capable of the intense heat that modern Eggs could withstand, and stood the risk of cracking when fired up into the kiln temperatures. This was fine with me, since I had little interest beyond hamburgers and steaks. My real interest was in the long, low and slow heats that it could provide for smoking. I strapped the egg into the front seat of my Ford and seat belt bucked it in… carefully driving it the 100 mile trip back to its new home. My Old Egg has been wonderful. We’ve cooked so much together… I only have a few regrets. We’ll never have the chance to cook a TurDuckEn, for example. But today, we’re trying to focus on the good times. At about 1:30pm, almost 5 hours into two pork butts, I went to test the temperature and take a few photos to send out to my twitter folks. Twitter is strange; there are many people I’ve never met, that I’d never recognize on the street, who’s family story or personal struggles are completely unknown to me. And yet, we’re friends. Brothers who’s only real bond is the love of the grill, the smell of the fire, the connection to that primeval drive to take a raw chunk of meat, hold it over a fire and then eat it. It’s completely absurd, but sharing a 12 hour long smoking session with people you’ve never met (and who are genuinely interested in what your brisket looks like) is like attending a BBQ contest, without the competition. So naturally, I’d been excited for the latest update; the smell of this pork alone has been driving my family crazy for the last few hours and I was ready to crack the Egg open and see how things were going. I’m going to remind you about the nature of my Egg; its ceramic. Its like a huge flower pot for cooking meat. The bands and screws that hold this thing together have to be carefully tightened – not too much, not too little. In all honesty, if I was a real man who had his stuff together, I’d have a monthly maintenance schedule and a tiny torque wrench. I’d carefully record the changes in expansion and contraction and monitor the updates. Frankly I’m surprised that, as a tech guy, I haven’t come up with some kind of “internet of things” approach to monitoring my antique grill. I slowly opened the Egg, pushed the hinge that locks the lid opened, and started in horror as the entire dome continued moving backwards in a slow, inevitable arc of death. It was truly a moment where time slowed and I was able to reflect on what has happening while it happened. The huge circular band that holds the lid on had worked its way loose, and when it stopped moving, the lid continued – directly off the Egg and onto the concrete below. “It will just crack in half” I thought; something that I could attack with JB Weld. I’ve had Frankenstein grills in the past, no worries. As I slowly looked behind the body of the Egg, I saw that I would indeed need All The Kings Men. 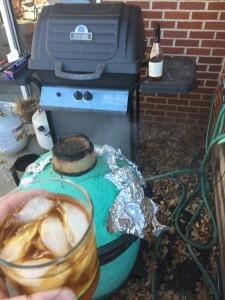 I don’t have many pictures from this period, because I quickly realized that I was half way through a smoking session with no lid for my smoker. It was some time before I was able to turn my attention once again to the future. At once, all my energy went towards saving “The Meat”. This is after I picked up the two big pieces and put them back on top… Suddenly I was in a Reverse-Eskimo situation. I had to rebuild a really hot dome in record time in order to finish my smoking session. A couple of the pieces were too small, and I managed to step on another in my frantic rush to get the thing covered as the flames started to grow. I found myself searching for some way to patch the holes. I felt like Maverick, floating in the shark-repellant dye holding the lifeless body of Goose. Even with all the cracks, I have it holding at 275 – hotter than I’d like, but I think I can pull it off… at least for this final smoke. It’s like that horrible moment in Signs when Mel Gibson’s character is talking to his wife who’s only alive because the car that cut her in half is holding the top of her together… I’m talking to my Egg like everything is fine and we’ll have many happy years of smoking in the future… but I know that as soon as i pull the lid off for the last time, it will be all over. And so I drink. To the memories, to the good times. To the steaks we’ll never have.